2019 welcomes our 6th edition of the " Spa Belgian Rum Festival " ! 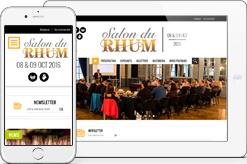 After five successful editions, to the full satisfaction of our Rum Aficionados, the 6th edition of the ‘Belgian Rum Festival will take place on 12 & 13 October 2019, at the Centre Culturel de Spa (Belgium). Thanks to your particiaption, this unique event has become the “Belgian Must be” for Rum lovers and will host, this time again, a great number of distilleries. This year, no less than 120 producers will be represented... for the pleasure of your tasting buds! A perfect opportunity for you to enjoy, on your own or with some friends, rums from all around the world and discover a wide range of unexpected flavours (agricultural, industrial, spicy, old, rums...) in a spacious, original and elegant venue. Rum drams will be available either as free tasting or against payment with tokens according to their age and rarity (this guarantees access to really unknown products). Most of the Rums available for tasting will also be on sale in our "Shop". Taste, order, buy,… the easiest way to go back home with your prefered Rum and a wonderful souvenir. An exceptional opportunity to have access to such a wide variety of tastes and smells. The " Spa Belgian Rum Festival " is also a cosy, family and friendly atmosphere... all organized by passionate people always at your service and disposal !